Fiddle Yard Dialog Generel Tab. Unique name to identify this Fiddle Yard object. This number is used for mapping a switch command by address to this Fidle Yard for next/previous track. Free text to describe this Fiddle Yard. To save a lot of real sensor inputs this option will share the ones defined for the Fiddle Yard routes with the connected track blocks. Only the selected track should be able to generate sensor events; mechanically it could be solved by a ground roller underneath the moving table. Set this option to avoid setting up routes to and from all track blocks, but setup only a route to and from the Fiddle Yard. In this case the Fiddle Yard will act like a block manager and will dispatch the sensor events to the active block. 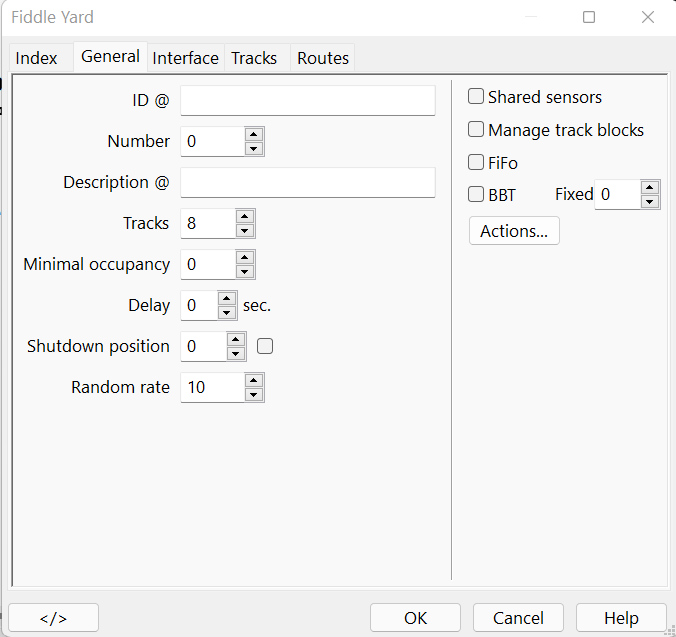 Also the Fiddle Yard position command is generated automatically, so the Fiddle Yard track command can remain at zero for route switch commands. Trains can only leave if the minimum amount of blocks are occupied on the FY. This feature is disabled when set to zero. Uses "First in, First out" procedure to let trains laeve the Fiddle Yard. Do not forget to set the Fiddle Yard as switch in the routes from and to the Fiddle Yard to force the train to wait until the Fiddle Yard reports "In position". The max. number of tracks is 128. The FY symbol in Rocview is limited to 32, so for 128 both sides must be set up with two rows of blocks. Delay in seconds between the last unlock and a new lock of the FY. Without this delay the train could still be decelerating when the FY starts moving to another track. The FY listens to system events. On shutdown it moves to this position if > 0. Enable BBT for all Fiddle Yard blocks; Default is enabled. See Block BBT for more details.